[Tomato Dirt] Have You Started Next Year’s Tomato Compost Pile? Join us on Pinterest! Browse our 100+ boards (and growing) for all kinds of tomato inspiration and practical information: growing tomatoes, harvesting tomatoes, cold frames for tomatoes, tomato books, tomato greenhouses, compost for tomatoes, indoor tomatoes – even crafts to do with a tomato theme, now that cold wather is here. Happy pinning! Fall and winter may be the “off season” for your tomato garden, but it is the ideal time to prepare for next season. One element to consider is compost. If you don’t have a compost pile – or if your compost is depleted from the past season – now is the time to build one. Decide whether you want to have an enclosed compost bin or an open bin. Choose a designated area for your bin, preferably in the sun and where it can be protected. Layer 6-8 inches of “brown” items (dead leaves, shredded paper and cardboard, wood chips, and hay) on the bottom of the pile followed by “green” items (fruit and veggie scraps, coffee grounds, tea bags, egg shells, grass clippings). Broadcast a few handfuls of fertilizer over the organic matter layers. Moisten and repeat the layers. Turn the pile every 1-2 weeks. 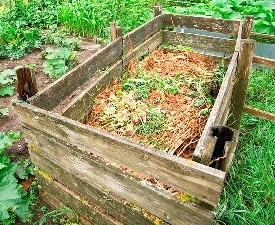 Get more information on composting basics for tomatoes to get started. And be sure to check out our Compost for Tomatoes board on Pinterest for more helpful ideas about building a compost bin or adding to yours. 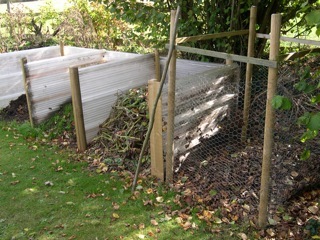 Autumn is an excellent time to start a compost pile, thanks to falling leaves. The best combination in compost raw material, by volume, about 3-4 parts of “browns” to one part “greens” – meaning your raked leaves can have a useful new home in your compost bin. As your arms get sore from raking leaves, dream about the “black gold” your compost will produce to add to your tomato garden next spring.